Official bike of the Tour de France brand. 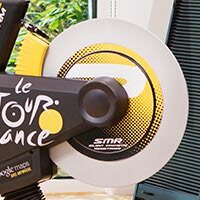 Race through the actual Tour de France from Utrecht, Netherlands to the Champs Elysees in Paris or create your own stage anywhere in the world with iFit® technology. Speed past the crowds via Street View on the 10-inch touchscreen console delivering incredible views as you pedal. Condition for any race, any stage, any summit with iFit® technology. Powered by Google Maps™, you can draw a route anywhere in the world—and then ride. Follow along via Street View on our high definition 10-inch touchscreen display. *iFit® wireless technology built in—no module required. 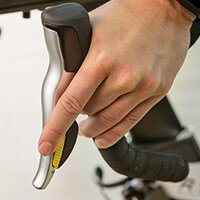 Access your iFit® account from your Enabled exercise equipment, computer, tablet, or smart phone. Annual membership fee required, sold separately. Google Maps™ is a trademark of Google, Inc. Android is a trademark of Google Inc. This bike accommodates up to 125 Kg. 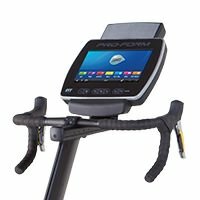 The ProForm® TDF Pro 5.0 is protected with a 2-Year Parts, Labour and Frame Warranty.